Download latest version of FreeBSD. Select ISO image download that suits your system architecture platform (for example, machine on Intel Pentium-IV or AMD AthlonXP is based on i386, while AMD Opteron is amd64 architecture) by clicking on corresponding [ISO]. Burn the file (ISO image) to a CD disc (refer to your CD-RW or DVD-RW manual if you not sure of how to burn a image file). 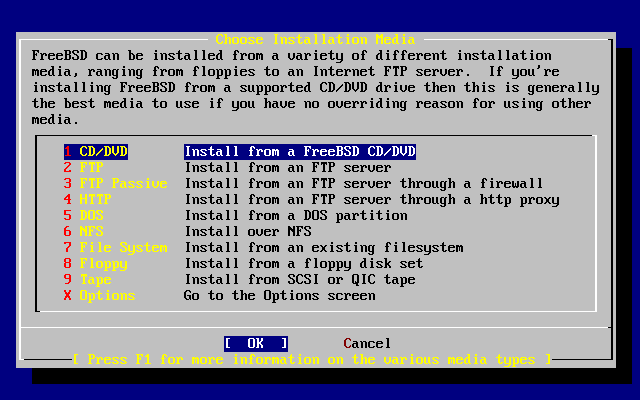 Insert the newly created FreeBSD CD to the computer that you want to run as web server and power on the computer. If you want to use multiple operating systems on the computer to co-exist, or your system already has operating system installed, you must free up a primary partition for FreeBSD installation. You can modify partition with fdisk on DOS or Windows, FIPS and PResizer from tools directory in FreeBSD CD, or with third-party software like PartitionMagic that is able to modify NTFS partition. Boot from CD when computer starts up. 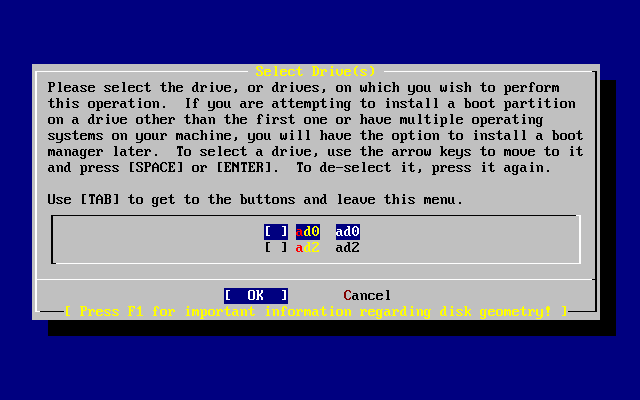 If booting from CD capability is not enabled or has lower priority than hard disk, change it in BIOS. 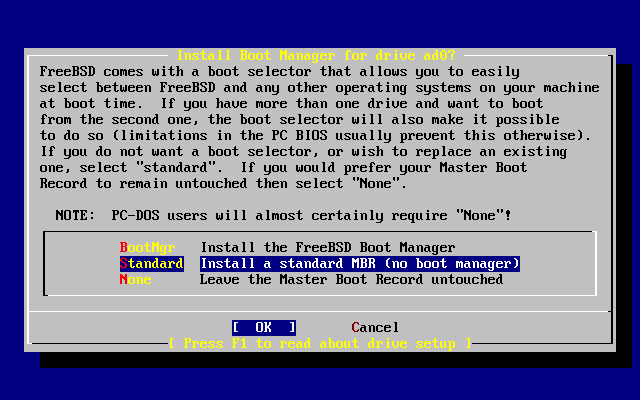 Once FreeBSD boots up, you will see a menu titled ‘sysinstall Main Menu’ that contains all the installation options. Select ‘Standard’ and press Enter. 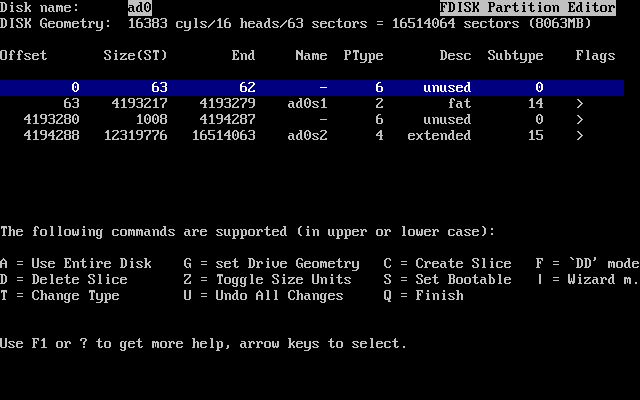 If you have more than 1 disk drives detected, FDISK will prompt you to select which disk drive you want to use. Just select accordingly (For the purpose of this tutorial guide, select the first primary hard disk). Depending on how is the layout of your current hard disk, you may need to press D to delete a or some partitions to make room for FreeBSD partition. You can create a partition by pressing C. If your hard drive is empty and you would like to use entire disk for FreeBSD, press A. When done, press Q to finish and exit the FDISK process. Next, a boot manager needs to be installed. You can select either BootMgr or Standard (Standard will suffice if FreeBSD is going to be the only operating system on this machine and it’s installed on the first hard disk). 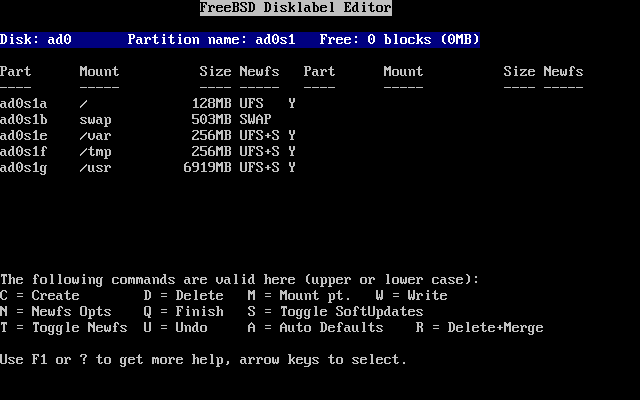 At FreeBSD Disklabel Editor, press A to let FreeBSD automatically creates the partitions and set the partitions to default sizes. Note: /var will contains all log files, mail files, database files and etc. If you’re running FreeBSD as http web server or ftp server, the default size of /var is most likely not enough in future. You will need to increase the size of /var now by reducing the size of /usr. To do this, scroll to /usr and press D to delete /usr partition. Then scroll back to the first row (where specified free space available), press C, then key in your desired and reduced amount of blocks or space to allocate to /usr partition, select FS (A file system) and key in /usr as mounting point. Repeat the same process for /var, with increased blocks or space allocation. Press Q when done to exit. At Choose Distributions screen, select Developer or User (if you don’t want the sources). Select [Yes] with arrow keys and press Enter to install FreeBSD Ports Collection when prompted. This allows easy installation of Apache, MySQL and PHP later. 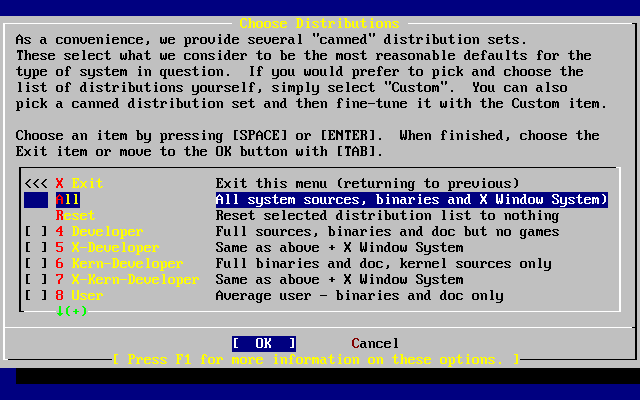 After returning to Choose Distributions screen, scroll to Exit with arrow keys and press Enter. Select CD/DVD when prompted to Choose Installation Media. Note: If your FreeBSD Installation CD is too old, you can choose to install via FTP, which will fetch and download the latest build release. 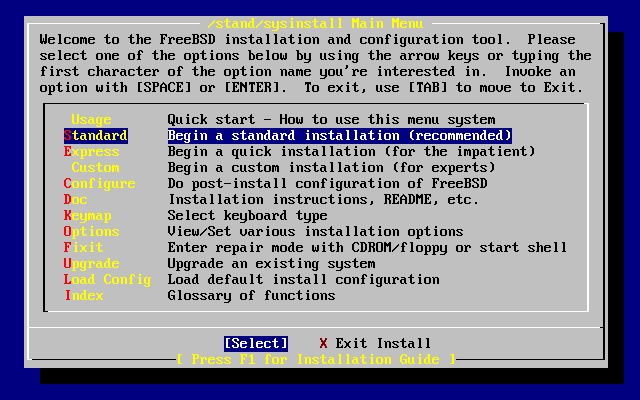 Configuration of FreeBSD has been set and installation can be started. Commit to the installation of FreeBSD when prompted. Warning: All data on the hard disk may be lost! The hard disk will be re-partition and re-format during installation. do so by typing: /stand/sysinstall . Press Enter to proceed to post-installation configuration.